Capitalize on trends by adding technology to your standard displays. These portable exhibit solutions utilize the devices your visitors are using to help you start the conversation. 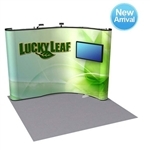 Bring your brand to life with our unique trade show display solutions. Kit Includes: (1) Power pole, (1) Round counter top, (4) USB ports, (6) 110 VAC Outlets, (1) 3-Sided Topper, (1) Base NEW PRODUCT! A complete display kit option for an interactive marketing experience. Included in Kit: (9) Tall panels w/ graphics, (4) Half panels w/ graphics, (2) Consoles, (1) Shipping crate. mount, (1) molded OCE case and (1) SCRATE case Kit Includes: (1) Frame, (2) Side/top white accents, (4) Fabric graphic panels, (1) Illuminated graphic panel, (2) Pillowcase fabric graphics, (2) Counters, (2) Medium monitor mounts, (1) SCRATE and (2) Woodcrates Includes: Oval Top, Base, Cable Grommets, iPad Mount, Printed Graphics and Shipping Boxes. Includes: Case, Handle, Straps, Dry-erase board, and Wheels. iPad Kiosk / Tablet Stand / workstation Includes: Standard, Solo, Pronto Post and Shipping Box. Graphics not included. Give your exhibitors a unique hands on experience with the iPad Kiosk. This is a great addition to any trade show display and most of all one of the most effective marketing solutions out there. Built with a secure locking case for the iPad and a nice graphic wing so you can display your brand and/or logo. Exhibit DEAL delivers high-quality tech displays in the fastest time possible. Have questions on a digital billboard, charging station, screen display or multimedia case?